For high level aged and acute care, look no further than the Sovereign Pressure Care Mattress. Patient care and comfort are seamlessly combined in the Sovereign making it the ideal choice for those who really care. Strategically placed profile layers, together with the Visco Memory Pressure Sensitive Contact Surface make the Sovereign a real winner for facilities and homes who seek only the best. Tailor-made from only the finest of foams and fabrics, the Sovereign is able to be customised any way you require. From specialised covers to bariatric rated foams, our team ensures customisations are easy. 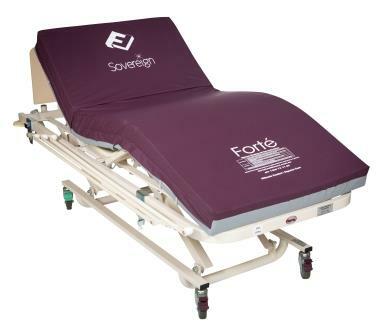 With all foams carrying a 5 year warranty and cover fabrics up to 3 year warranty, you can rest assured the Australian made Sovereign will be caring for your patients for many years to come. Ventraflow® Pressure Care Layer provides optimal patient immersion. Unique modulations allow the Sovereign Mattress to conform seamlessly to the patients body, protecting critical and vulnerable pressure care areas. The Ventraflow layer also allows full internal air movement within the mattress, dissipating heat and enhancing circulation. Airo-form Visco Memory Patient Contact Layer-Provides excellent heat dissipation, immersion and Patient Comfort. Ventilation holes allow the upper Memory layer of the Sovereign to ‘breath’ ideally suited to Patients who experience heat related discomfort. Airoform foams are very high density allowing the Patient to ‘float’ and offer maximum temperature stability. Profile Hinged Strengthened Sides-Allow the Sovereign Mattress to conform seamlessly to any required bed position. Premium foams enhanced lateral mattress stability, reducing risks of patient falls. The Strengthened Sides make Primary Patient Care easier and safer.